It was only last weekend when my husband and I met my good pals in Singapore, Iris and Rej, for some Indonesian dinner, long (diabetic) supper 'til midnight and shared a cab home in Singapore. And now here I am, already in Malaysia. Already more than half way to the plan of permanently staying here with husband. Last Saturday night: The trio at Coffee Club, Somerset. The Coffee Club's Mud Pie. We, Singaporean, Malaysian, Indonesian and Filipino loved this. The Coffee Club's Carrot Cake. On last Wednesday, I had a farewell lunch with my Bishan ex-housemate and one and only Indonesian lunch buddy in Nicoll Highway area, Liza. We had it at the Aston's Restaurant which is next to my office building. Liza said, my colleagues took me to this restaurant on my first working day there back in November, so she wanted me to dine at the same venue before I leave too. So sweet of her. I am so gonna miss her - chatting with her and listening to her big-sister-advice over lunch. I really hope I could cross path with her again in the near future, be it in Singapore, Indonesia or Malaysia. Too bad, I never took a photo with her. Shame, shame. Aston's Grilled Fish with Herb Sauce for Wednesday lunch. As time goes by, too fast as usual, last week was my last working day in Singapore. After explaining my current personal situation to my line manager, I officially resigned on last Monday and served the week out since I was still in probation. It was a shame to be able to extend my service to my new company for mere two and half months, two weeks before I was about to be confirmed. I just had my new business cards printed just on the day before my last day there. On Friday itself, I had my farewell lunch with my Filipino colleagues, Joel and Bella. We had a long chat on my future plan in Malaysia, housing in Singapore and Bella's pregnancy journey. After lunch, my colleague, Christopher surprised me with a nicely wrapped present, which he did himself. Right after he came back from lunch, he came to my desk and threw a small box to me, just like that. I was so shocked and embarrassed accepting his farewell present since I didn't stay long in the company. Chris and I happened to bump into each other on our way in and back to work, we chatted a lot during our commuting times, quite frequently. I was touched by his friendliness and concern. He is indeed a nice and hardworking young chap whose strength and determination I really admire. He works full time and studies part time almost every day. Later on, Victor gave me a cute rabbit cupcake he got from a sponsor's event he attended earlier. Farewell present from Chris and a Rabbit Cupcake from Victor. I blasted my farewell note email to all my colleagues in Singapore and Hong Kong office at around 4pm and was pretty touched to read their immediate responses over my sudden departure and relocation to different country. And hopefully you will enjoy the next adventure of your life! I can't find you on facebook. Add me. Q, will be missing one more of the 'good people'. What can I say. By the way - told my old schoolmate u were 'taken'. He said he'd stay away... didn't want to have his face punched. Ha! Ha! All the best! Keep in touch (if you can) and Adios Amigos! This is very sudden news indeed. I do wish you all the best with your relocation and new endeavors (at least you won't have to put up with your cranky tenant). Take care and do keep in touch! Wow! Quite the surprise... Hope you're excited about the change of environment. Thanks for your effort and good luck. Sad to know you are leaving. But I am sure you have made the best choice amongst all options for the best outcome. Thanks for helping me out with ICCM. I wish you the best in 2011 and beyond. Take care. And there was a speaker in Singapore who congratulated me on my relocation. His advice was change is the touchstone of progress. I couldn't agree more. That was it. Another last day at work. After work, I met up with my husband and we had our dinner at Junction 8, our favorite mall in Bishan. We ate the rabbit cupcake as our dessert after we had our Japanese dinner there. Apparently it was a carrot cupcake. My husband's favorite. 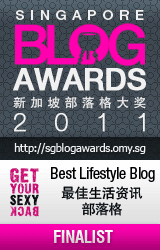 This could be our last time scouting our favorite mall, Bishan's Junction 8. Me and the cute rabbit decoration at Junction 8. Fret not, after this coming Chinese New Year, I will still be coming to Singapore to finish packing and do some more proper farewells with all my friends in Singapore. I just stumbled into a church fellow's blog and bumped into his post about worry and fears in life. A simple thing that he learned from pigeons he came across in the street. Gee, I guess I have been skipping church for way too long so that I totally forgot of the existence of the book of life. I forgot that I should be able to find solace there and shall not fear nor worry about things. The book has all the answers for life's FAQs. 24. 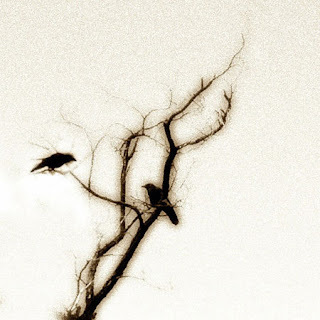 Consider the ravens: for they neither sow nor reap; which neither have storehouse nor barn; and God feedeth them: how much more are ye better than the fowls? 25. And which of you with taking thought can add to his stature one cubit? 26. If ye then be not able to do that thing which is least, why take ye thought for the rest? 27. 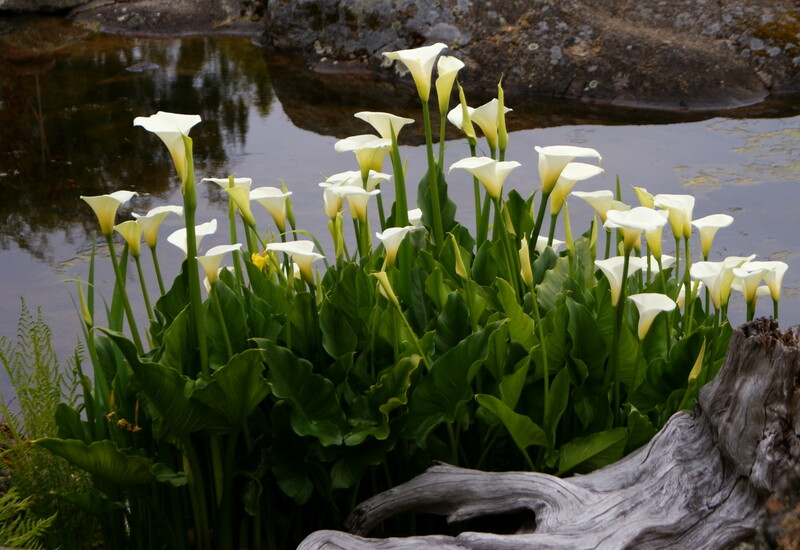 Consider the lilies how they grow: they toil not, they spin not; and yet I say unto you, that Solomon in all his glory was not arrayed like one of these. 28. If then God so clothe the grass, which is to day in the field, and to morrow is cast into the oven; how much more will he clothe you, O ye of little faith? 29. And seek not ye what ye shall eat, or what ye shall drink, neither be ye of doubtful mind. 30. For all these things do the nations of the world seek after: and your Father knoweth that ye have need of these things. 31. But rather seek ye the kingdom of God; and all these things shall be added unto you. 32. Fear not, little flock; for it is your Father's good pleasure to give you the kingdom. 33. Sell that ye have, and give alms; provide yourselves bags which wax not old, a treasure in the heavens that faileth not, where no thief approacheth, neither moth corrupteth. 34. For where your treasure is, there will your heart be also. 25. Therefore, I say unto you, take no thought for your life. What ye shall eat, or what ye shall drink; nor yet for your body; what ye shall put on. Is not the life more than meat and the body than raiment? 26. Behold the fowls of the air; for they sow not, neither do they reap, nor gather into barns; yet your heavenly Father feedeth them. Are ye not much better than they? 27. Which of you by taking thought can add one cubit unto his stature? 28. And why ye thought for raiment? 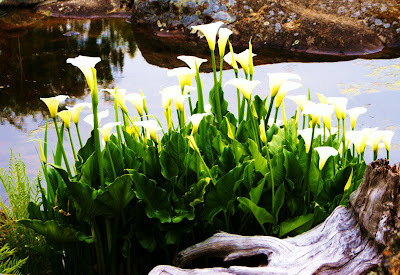 Consider the lilies of the field, how they grow; they toil not, neither do they spin 29. And yet I say unto you, that even Solomon in all his glory was not arrayed like one of these. 30. Wherefore, if God so clothe the grass of the field, which to day is and tomorrow is cast into oven, [shall He] not much more [cloth] you, O ye of little faith? 31. Therefore take no thought, saying, What shall we eat? or What shall we drink? or Wherewithal shall we be clothed? 32. (For all these things do the Gentiles seek) for your heavenly Father knoweth that ye have need of all these things. 33. But seek ye first the Kingdom of God and his righteousness; and all these things shall be added unto you. 34. Take therefore no thought for the morrow: for the morrow shall take thought for the things itself. Sufficient unto the day [is] the evil thereof. The latter words of wisdom are my front-runner Bible verses yet commonly forsaken. I am a Christian by faith but don't really practice religiously Christianity. I tend to seek when I need only. Don't follow me on this. Not a good example. You should find God every time, not only when you need Him. Anyway, I think no need to be one to appreciate the good gist from the book of life and other life lessons from other beliefs. Some things are just good to know as it holds true in life. *Photos are randomly taken from the internet source. Despite my family, do you know one of the reasons why I am so patriotic to be an Indonesian? The food. I just can't live without Indonesian food. Period. I've gone to many countries and train myself to eat international food as my daily diet, not merely Indonesian dishes as before. However, nothing beats the feeling of being home by eating my own national food. The food I ate as I grew up. I crave for real Indonesian food at least once a week, and probably my craving could last for once a month, the longest. Sometimes, it is not that handy to find Indonesian cuisine in Singapore, so the closest I can get to it to satisfy my taste bud is by consuming Malay food. To me, Malay food is still pale in comparison to real Indonesian food. 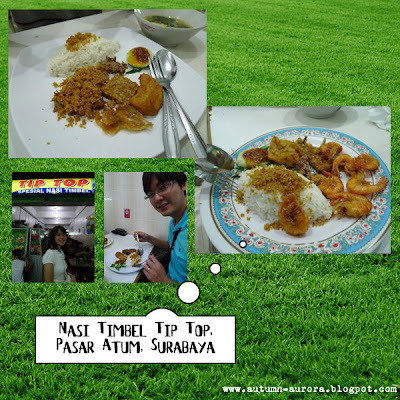 No pun intended, this is just some two-cent thought from a true-blue Indonesian food fan. Here are a compilation of some good food that I happily gorged into my mouth during my last visit in Malang. Some of them are my "must-eat" kind of food when I go home. 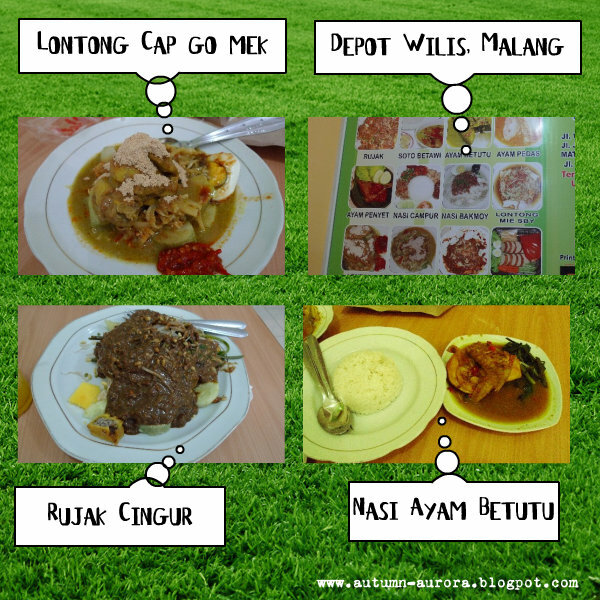 I am so proud for being someone who come from Malang, a food heaven when many people deliberately visit for its famous local cuisines in East Java. 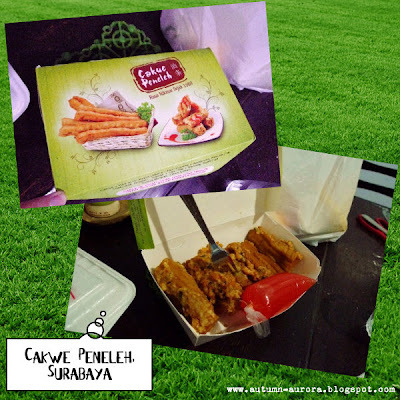 My Mom always buys Cakwe Peneleh (Cakwe/You Tiao) from Pasar Atum, Surabaya whenever she has the chance to go there. My family has been buying this since more than twenty years ago. 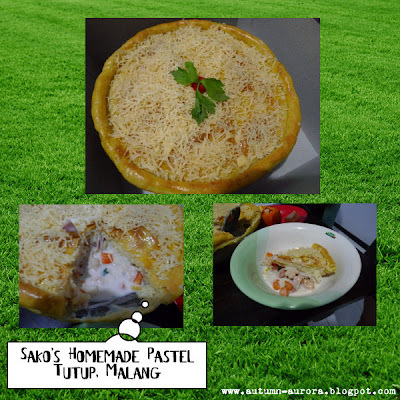 You can't find an exquisite and unique Cakwe topped with shrimp fillings like this in other part of the world. Originally from Surabaya, the infamous Ayam Penyet Bu Kris restaurant had built its several branches in Surabaya and Malang, for what I know. 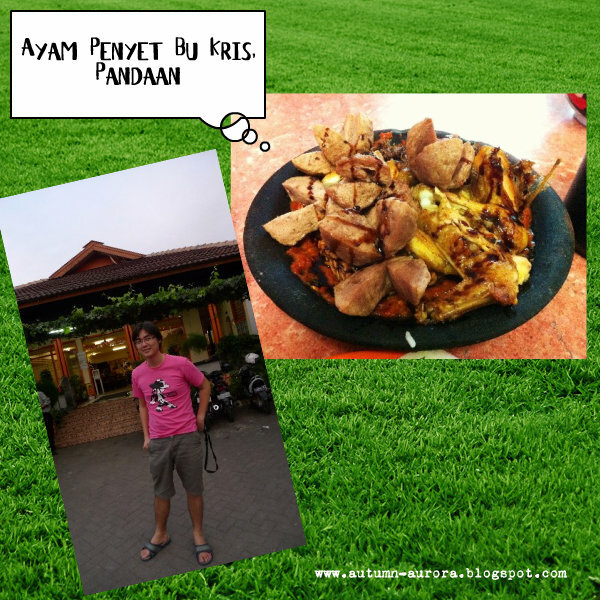 They serve slightly different style of ayam penyet (smashed chicken) in Singapore's Indonesian restaurant but Bu Kris's ayam penyet is one of the food icon of East Java. These are some pictures of local Nasi Bungkus (packaged rice) that my Dad bought from nearby stalls, usually for our breakfast. They are simply cheap yet delicious by default. Cenil and Lupis are traditional Javanese delicaces made from starch, sticky rice, coconut and palm sugar. They are usually bought from stalls in traditional wet market or a door-to-door seller in residential area. These days, on average they cost about Rp. 5000 (around S$ 0.80)/pack. Surprisingly, my husband loved this sweet dessert when my Mom bought some for him. 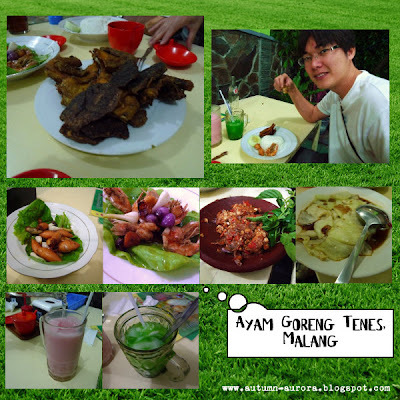 For one dinner, we went to Depot Ayam Goreng Tenes, which is always full house. Their ayam goreng (fried chicken) is a local legend. The herbs were perfectly absorbed in the chicken meat and when you finally eat the fried chicken, you could really appreciate the tasty melt-in-the-mouth chicken. I could not resist eating their fried chicken's skin too, which I usually discard. When we had our dinner there, the fried chicken came last. Before then, my husband commented that the food we had there was more like a camping food i.e. plain fried rice and a bit of fried sea food and sauteed vegetables. Frankly, I was a bit offended with his remark but it was all gone when he said "Wow! This is super good!" once the fried chicken came to our table and my husband had a small bite of it. He ended eating one chicken breast and one chicken thigh. I was craving Rujak Cingur for the longest time but we didn't have the chance to buy a tasty one from the neighborhood. That day, my Mom brought my husband and I to a small eatery near the bridal salon where I fit my wedding dress. They happened to sell Rujak Cingur, a traditional fruits and vegetables salad topped with peanut and shrimp paste sauce, but apparently this food didn't give good impression to my husband. He didn't quite like the taste of Lontong Cap Go Mek either and still preferred the Lontong Sayur of Malaysia. He ended ordering Nasi Ayam Betutu, which was acceptable for his palate. I guess Rujak Cingur can only be fully enjoyed strictly by locals. My auntie personally made her specialty Pastel Tutup (Closed Pie), a quintessential Dutch-Indonesian-Chinese dish so my husband could taste this. She occasionally bakes this upon requests and sells this to her friends. It contains diced ham and chicken meat, mushroom, cubed carrots, vermicelli in sweet milk soup wrap with baked mashed potato and cheddar cheese. It's a very tricky dish to make since you need a very good consistency in the mashed potatoes for the cover. 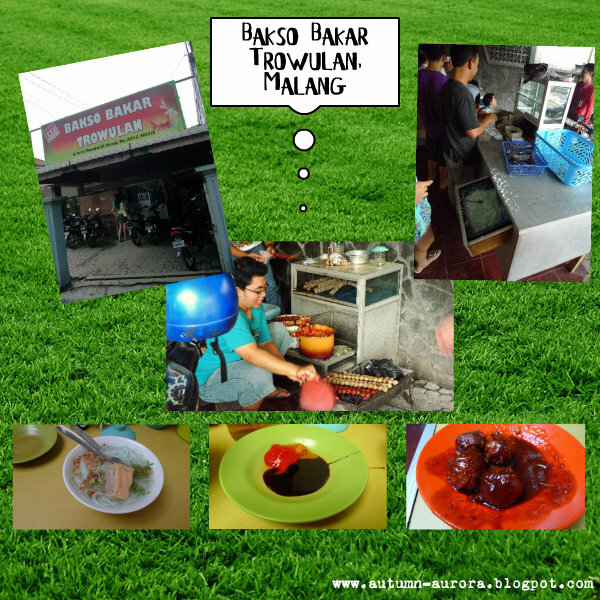 On one late afternoon after shopping some snacks and visited a small Mall in Malang, my sister took us to Bakso Bakar Trowulan, few minutes driving from my house. This place sells grilled meat balls that you can't find in other place in Indonesia, at least with their standard of cooking. We tried to eat similar Bakso Bakar restaurants in Malang, but nothing championed this place yet. Once, this small restaurant was reviewed in national TV too. They charge Rp. 1,500 (about S$ 0.20) /meat ball and free of charge free-flow vermicelli. It was 3pm then, but people flooded their place and fought for their grilled meat balls and vermicelli. On my second last day in Malang, after we put my Mom's old broken guitar to service, my parents offered my husband, Baby Jennifer and me a Rawon lunch at the most popular Rawon restaurant in town. I said yes, yes, yes! I dare to claim that nobody could cook beef black soup like this place does. Theirs is just extraordinary. I have been eating this since I was a small kid. Then, my parents often brought all their kids to eat there on some mornings on weekend or school holidays or buy some of the soup back to enjoy at home. This was my last lunch we ate out with my parents before we left Malang. On my last night in Malang, my sister and her fiance brought us to eat grilled corn nearby for supper. It is also one of the icons in Malang. The grilled corn is generally sweet, salty and buttery. If your stomach and tongue can't take hot stuff, don't event think of ordering their hot grilled corn. It could burn your tongue. One of my distant relatives, once tasted the grilled corns in this place, was inspired by this local business and opened his own Jagung Bakar (grilled corn) in Surabaya. I heard his first outlet was so successful and prompted him to open few branches more in the city. Right before we headed to Surabaya Airport on our last day in Indonesia, we had our lunch in Pasar Atum in Surabaya. I spotted this familiar restaurant when I was accompanying my Dad looking for a suit tailor there. I remember I ate their delicious Sayur Asam (Sour Vegetable Soup) long time ago so I was so keen to try it for one more time. My instinct was correct, I was in the right restaurant I visited many years ago. All of us agreed, their Sayur Asam was very nice. This is why I love Indonesia, especially Malang! Bless you who stay there or nearby there, at least. Thee shall never run out of good food. 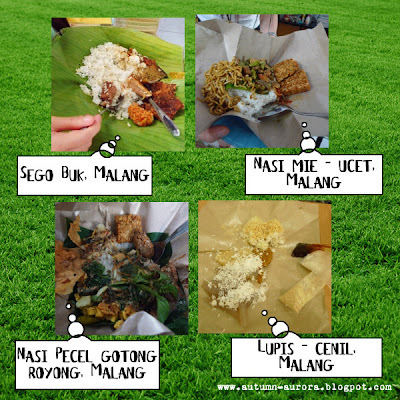 By the way, you'd need some local guidance to get you all these food galore in Malang and Surabaya.